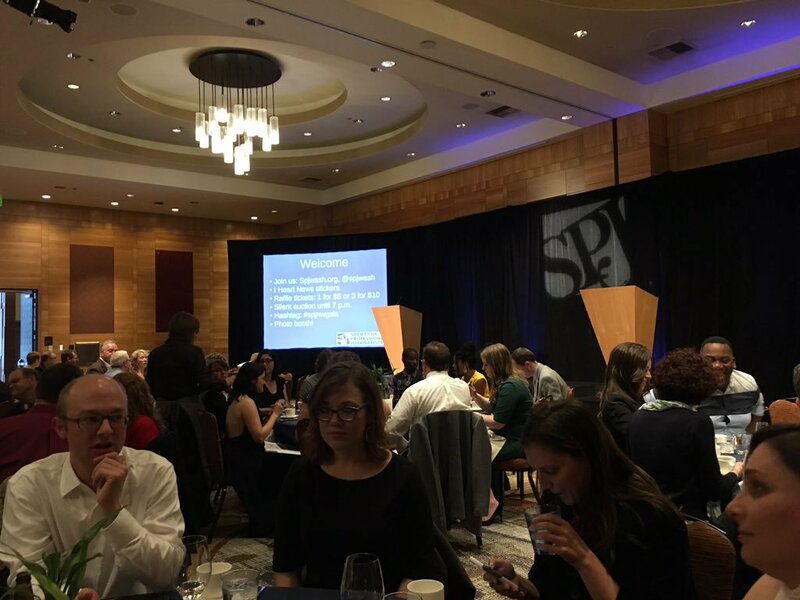 The 2016 SPJ Northwest Excellence in Journalism awards ceremony. Friends — Each month we send InvestigateWest members an exclusive dispatch from our newsroom. It’s our way of saying thanks for your continued financial support of IW and change-making reporting. This month, Development Manager Heather Kosaka looks back at the Society of Professional Journalists awards, and what they mean to up- and- coming reporters. I don’t do this all the time. But sometimes I just have to say how proud I am of InvestigateWest and the team of freelance writers, photographers and data-analyst specialists who make up our organization. We’re lean. We’re hungry for a solutions. And it shows. It was evident at this year’s Northwest Excellence in Journalism awards hosted by the Society of Professional Journalists to celebrate journalists who went above and beyond to get a story in the past year. The contest is the largest of its kind in the nation and covers everything from rural, sparsely populated areas to big cities and everything in between in Alaska, Washington, Montana, Oregon and Idaho. The contestants represent the very best in a field of reporters, editors, educators and innovators. And that’s saying a lot. Many talented journalists cover the Western United States. Still, you’ve read the statistics: In newsrooms in Oregon and Washington, U.S. Bureau of Labor Statistics reports show the number of news reporters plummeting 40 percent in a decade, from 1,970 in 2005 to 1,190 in 2014. Capitol reporting has experienced even more dramatic cuts. Pew Research estimates a 35 percent decline in statehouse newspaper reporters since 2003, an even steeper fall-off than in newsrooms overall. In a resource-constrained media ecosystem that struggles to tell its most important stories, SPJ sets out to inspire the next generation, to promote diversity in the industry, and to nurture journalism in our communities. Our reporters do a great job of representing SPJ’s spirit. Even in a shrinking field, the competition is stiff. Four InvestigateWest reporters received awards. Managing director, Lee van der Voo and James Gordon won first place in the business reporting category for How Cash Sent the Portland Market Spinning, and van der Voo’s piece on government transparency in Oregon, which ran in her monthly Redacted column, won first in the non-daily column category. Ashley Stewart, a 2015 contributor for Capitol reporting from Olympia, was named a New Journalist of the Year. And Francesca Lyman won a first-place award in the investigative reporting category for Profiting from Thrift. Lyman also won third place in the business reporting category for the same story. In the spirit of SPJ’s Northwest Excellence in Journalism, InvestigateWest is excited to develop the next round of talented, deeply engaged reporters. Our newest intern, Adiel Kaplan, recently reported a front-page story in Seattle Weekly on the future of Seattle’s open spaces. She also was interviewed on KUOW-FM, her first-ever on-air interview. Kaplan’s work inspired the city of Seattle to set aside the last of its open space for parks. When she followed with a story on the city’s eroding tree canopy, hundreds of citizens petitioned to improve protections for trees. Fostering excellence and raising the bar for the next generation of journalists is something to be proud of. So is the recognition they receive from SPJ’s Northwest Excellence in Journalism. But only for a moment. We’ve got work to do. Heather helps InvestigateWest to organize events and programs that increase support for public-interest journalism in the Northwest. Heather is working on her MPA from the University of Washington, Evans School of Public Policy and Governance. She is a volunteer board member for Seattle Mountain Rescue. InvestigateWest Managing Director Lee van der Voo attended the Investigative Reporters & Editors conference in New Orleans — read on to find out where the field of journalism is headed and how non profit journalism studios like InvestigateWest are part of the solution.